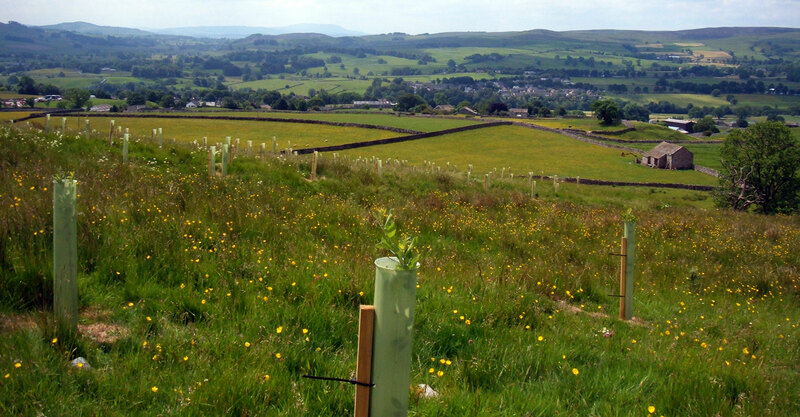 The site above Grassington is planted with 5,500 native broadleaved trees, predominately ash, but also includes oak, birch, rowan, holly, hazel, hawthorn and willow. The site above Grassington is planted with 5,500 native broadleaved trees, predominately ash, but also includes oak, birch, rowan, holly, hazel, hawthorn and willow. Tree guards have been used to protect the trees from rabbit damage. The site is adjacent to Kent furniture showroom and factory which is off Moor Lane leading north out of Grassington. There is a public footpath from the town which runs through the site and eventually meets Moor Lane further up the hill from the entrance to Kent’s. PLEASE NOTE: The woodland is situated on private land – please keep to the footpath in the wood.